This blog in hiatus for a reason, it just take a gut to write this. Never cross my mind that I’d write something about this…. at least at this age. Apparently, last Ramadhan was …bad. First, I forgot to switch my working hour so I could go home at 4.30 pm. (my) Office hour dismiss an hour later that I couldn’t do ifthoor with my children. It wasn’t that bad actually, but my mom was hospitalized on second day of Ramadhan and dad looked after her. Left my kids and bibi at parent’s house just the three of them. Thinking that they had their ifthor just the two of them broke my heart. the nightmare began. Within a week, my mom’s health getting worse. Not getting any better, the (team) of doctors discharged her and we prepared home treatment. Just to make the story short, shortly after she came back, her condition was at its worst. our world turn upside down….I don’t want to remember those horrible days…. 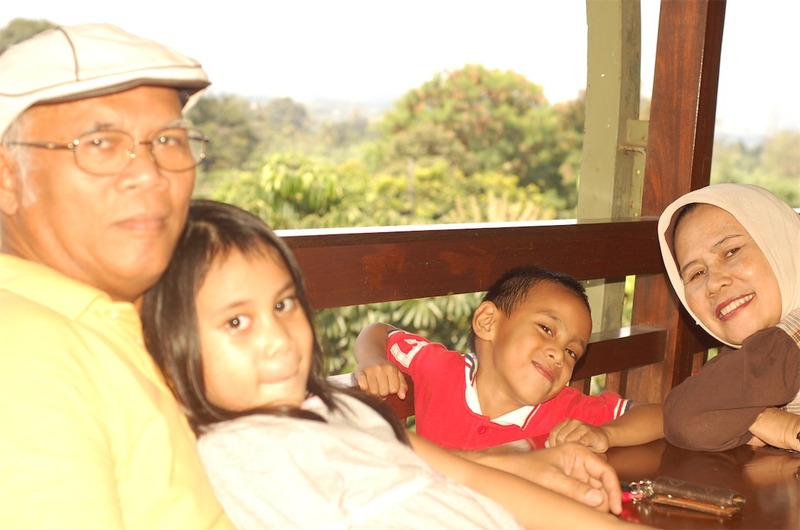 In the morning, her blood pressure dropped significantly, we called brother to be home ASAP at about 2.3o pm, she took her last breath…Innalilahi wa’innalilahi rojiun…terputuslah salah satu Ridha Allah di dunia untukku (and my sibblings). Dan lalu gw merasa dunia gw semakin gelap…. Mama pergi ditungguin seluruh keluarga, bahkan besan, ipar-ipar adek gw, spouse mereka dan teman-teman terbaiknya…. I cried even harder, that was the time I realized I will never see my mother again. Dan (tentunya) datanglah penyesalan itu.. I could remember when dad took me to train station he said “Mom is sick, dikuati-kuatin aja badannya” I wasn’t really paid attention to it. I didn’t spent much time with her. Mom had a green thumb, waktu gw bersihin tamannya gw nyesel ngga pernah sama-sama ngurus tanamannya. Whenever I had my morning run that started for my parent’s house, mom already in her garden. When I got home, she still there. Or when I prepared food for my kids, I realized I never know her rendang’s recipes. When I sit in living room, I still expect her coming out from the door across the room. When I came to musholla, I usually found mom either sholat or ngaji or just read a book. Whenever I come to Mushola, I still expecting to see her there. Even when I had my lunch at the office, I realized I’d never say “mama (saya) lah yang masak…” again. A picture popping up. May last year, my brother and I were about to send my parents and my daughter to airport to for their umroh trip. Sampe sekarang gw masih ngerasa mama pergi umroh, 4-5 hari lagi balik. Masih kayak mimpi. well, off course she’s not and unfortunately it’s not a dream. As everybody said, life must go on (and I know, it would be very very hard for me). I cry almost everytime. As I was waiting for magrib at Mushola kantor and recited verses, a colleague, yang biasanya negurnya cuma basa-basi saw me and telling a story about her late brother. At the end she said “bisa jadi adek saya dan ibu kamu justru lebih bahagia sekarang, daripada kita di dunia”. I agree. No one can tell. PS : terima kasih buat teman-teman/kerabat/handai taulan yang mendoakan bahkan menyempatkan waktunya untuk datang dari mama sakit, melayat,menyolatkan sampai ada yang ke pemakaman. We can’t thank you enough. Ky, turut berduka cita ya…semoga diberi ketabahan sekeluarga oleh Nya. Kehilangan siapa pun pasti sedih, ga kebayang orangtua sendiri Ky.. Gapapa ky namanya berkabung, grieving kepergian nyokap penting bgt, biar stay sane. Gue kehilangan oma gue yg ngurusin gue sampe skrg 14 thn kemudian masih aja masih sangat kehilangan. Gue krm doa semoga arwah beliau tenang skrg di sisi Nya. Amin. Ki, rintik2 mata gw bacanya… i think i will never be ready for it – what u have experienced… and u just being able to write it here beautifully.. it’s a tribute to your Mum Ki.. may she rest in peace and i can only offer my hugs to u.